The wall of worry continues to propel stocks higher as this long plodding economic expansion is assumed to be in the later innings. With low interest rates and slow growth, many are still waiting for the the full throated recovery to manifest. However, for the luxury and leisure world the good times just keep rolling. Cruise ships, air travel, luxury car sales, hotels …you name it and its delivering consistent sales expansion over the past 6 years. With aging boomers and an economic cycle with room to run there could be more to come from the big spenders and silver haired crowd. The global baby boom is transforming into the senior surge who seek more frequent and experiential vacations. As strong as the benchmark S&P 500 Index has been, the Luxury sector has outperformed most stocks. Travel isn’t just for the senior circuit. In a study looking at the priorities of Millennials, travel came out as a higher priority than buying a home or car, or even paying off debt. In China, travel was the highest priority by a wide margin. Floating hotels continue to benefit from appreciating retirement wealth from the rapidly aging 1st World countries. Carnival Cruise Lines stock is up 32% since Trump was elected and 340% since the 2008 bottom. Travel priority trends and the explosive Asian growth keeps airplane orders soaring with long term up trends in passenger air travel. Since Trump was elected Boeing is up 45% and best of breed Southwest Air is up 50%. Leisure air travel growth is outpacing business travel trends and with aging boomers flooding into retirement mode this supply will keep feeding air travel capacity for many years to come. 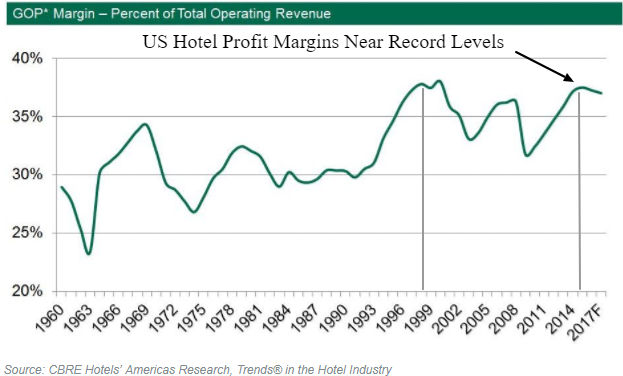 U.S. hotels led by resorts and casinos are achieving all-time record occupancy levels and near record profit margins. The upper-priced properties led the U.S. lodging industry out of the Great Recession and have continued to achieve occupancy levels in excess of 70%. Leader Wynn Resorts stock has gained 57% since Trump was elected. Near record 2016 US car sales have drifted lower in 2017, but super luxury and sports cars are surging higher as the the rich keep getting richer. Year to date car sales compared to last year has Jaguar up 88%, Rolls Royce 55%, Tesla 43%, and Maserati up 29%. When middle class car sales bounce back from the 2017 inventory glut as wages rise and employment keeps soaring, we would expect these Luxury cars to continue filling the garages of the almost rich and famous. In the U.S., seniors allocate 12.5 percent of their total spending to leisure, compared with U.K. seniors spending 23.2 percent and Japanese silvers that allocate 24.8 percent of their spending to leisure. The number of senior travelers from Asia-Pacific countries is predicted to double over the next 15 years. Other than cyclical recession risk, all major countries will be increasing the volume of travel and the amount spent per person in coming years which will keep this secular trend accelerating. Maybe you can’t afford a yacht, but buying the leisure and luxury stock dips in the sectors discussed should reward investors long term.